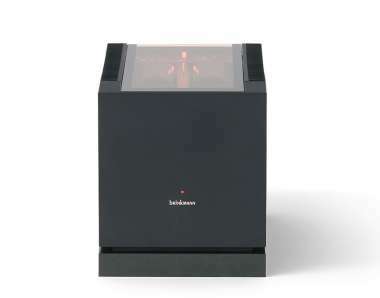 Today's speakers are capable of reproducing the full frequency range of music at realistic levels, including the deepest growling lows, the most subtle midrange shadings and the finest shimmering highs. Prerequisite are amplifiers that master the art of letting themusic flow freely, yet keep the speakers under tight control at every moment. 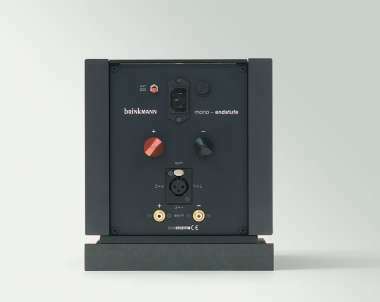 The »Mono« and »Stereo« power amplifiers live up to these requirements in the best Brinkmann tradition and stylewith a musically compact yet sonically open music reproduction regardless of frequency range and volume level. »Mono« and »Stereo« are amplifiers that come very, very close to the ideal amplifier as «straight wire with gain». There are many reasons for their musicality. One of them is an extremely stable power supply consisting of a transformer that can deliver up to 1500 watts peak power and four capacitors with a capacitance of no less than 132millifarad. Another one is the fully balanced driver stage. And let's not forget the output stage in “Diamond” topology that retains its low impedance at all frequencies and phase angles without feedback. The four Sanken high-performance transistors are attached directly to the speaker terminals – exemplary for the shortest possible signal pathwhich results in an extremely compact build. One last bit of trivia: one »Stereo« amplifier is half the cost of two »Monos«, although we do like to think that it sounds just as good!